I have taken many haunted Ghost Tours across the United States and around the world. Many of the tours are all very accurate in telling tales of the supernatural. But mny are just local legends and stories that parents told their kids to keep them in line. But as I have found the tall tales seem to feed off some residual engery and actually become a real bonified haunting. The belief in ghosts as souls of the departed is closely tied to the ancient concept of animism, which attributed souls to everything in nature, including human beings, animals, plants, rocks, etc. Although the evidence for ghosts is largely anecdotal, the belief in ghosts throughout history has remained widespread and persistent. In many historical accounts, ghosts were thought to be deceased people looking for vengeance, or imprisoned on earth for bad things they did during life. Most cultures have ghost stories in their mythologies. Many stories from the Middle Ages and the Romantic era rely on the macabre and the fantastic, and ghosts are a major theme in literature from those eras. The Hebrew Torah and the Bible contain few references to ghosts, associating spiritism with forbidden occult activities cf. Deuteronomy 18:11. The most notable reference is in the First Book of Samuel (I Samuel 28:7-19 KJV), in which a disguised King Saul has the Witch of Endor summon the spirit of Samuel. In the New Testament, Jesus has to persuade the Disciples that he is not a ghost following the resurrection, Matthew 24. In a similar vein, Jesus' followers at first believe him to be a ghost when they see him walking on water. Many believe haunted locations all have different reasons for being haunted. The truth is it all goes back to one basic problem. All ghosts want to be is the center of attention. Stare at the above image for 60 seconds then stare at a blank wall and what do you see? Something that was? Or is real? An image of something that was before your eyes and is now no more? PLEASE VISIT HERE TO LEARN MORE! Critics of "eyewitness ghost sightings" suggest that limitations of human perception and ordinary physical explanations can account for such sightings; for example, air pressure changes in a home causing doors to slam, or lights from a passing car reflected through a window at night. I'm not saying or debunking actual hauntings, I am just stating that a location may be haunted but not by the ghost that the Ghost Tour Guide story tells. A ghost is defined as the apparition of a deceased person, frequently similar in appearance to that person, and usually encountered in places she or he frequented, or in association with the person's former belongings. The word "ghost" may also refer to the spirit or soul of a deceased person, or to any spirit or demon. Ghosts are a controversial anomalous phenomenon. According to a poll conducted in 2005 by the Gallup Organization, about 32% of Americans believe in the existence of ghosts. The term ghost has been replaced by apparition in parapsychology, because the word ghost is deemed insufficiently precise. I have met dedicated Ghost hunters over the years from Hans Holzer to Troy Taylor and all those in between. Most will agree that they to are skeptical of tall haunted tales and urban myths. But half the fun is finding out the truth behind the story the experience and the actual ghost that haunts the location. Jeff Belanger's new book compiled from many told tales is an example of local ghost stories from many locations. His book may be filled with a feunbelieveable story or two but it's what makes ghost hunting fun. Critics of ghost hunting say there is a total lack of scientifically testable and verifiable evidence in favor of the existence of ghosts, despite centuries of interest in the subject. Often many tell of of ghosts "seen out of the corner of the eye" this may be accounted for by the sensitivity of human peripheral vision. Haunted locations are places that are allegedly inhabited by ghosts. The reports of these hauntings are often referred to as ghostlore. Ghostlore is fueled by historical facts, stories, and legends. Although relayed through reliable sources, these tales can often be subjective in nature and there is no commonly accepted objective evidence that ghosts or similar phenomena exist. Many haunted items also fill the world from haunted dolls, holy icons, toys to furniture. But alas is the item haunted or is it just frequently visited by a ghost... or is it a portal key to the other side. Pareidolia, an innate tendency to recognize patterns in random perceptions, can cause people to believe they have seen ghosts. The term pareidolia), referenced in 1994 by Steven Goldstein, describes a psychological phenomenon involving a vague and random stimulus (often an image or sound) being perceived as significant. Common examples include images of animals or faces in clouds, the man in the moon, and hidden messages on records played in reverse. The word comes from the Greek para- — beside, with or alongside — and eidolon — image (the diminutive of eidos — image, form, shape). Pareidolia is a type of apophenia. Approaching paranormal phenomena from a research perspective is often difficult because even when the phenomena are seen as real they may be difficult to explain using existing rules or theory. By definition, paranormal phenomena exist outside of conventional norms. Skeptics contend that they don't exist at all. Despite this challenge, studies on the paranormal are periodically conducted by researchers from various disciplines. Some researchers study just the beliefs in paranormal phenomena regardless of whether the phenomena actually exist. In 1957, the Parapsychological Association was formed as the preeminent society for parapsychologists. In 1969, they became affiliated with the American Association for the Advancement of Science. 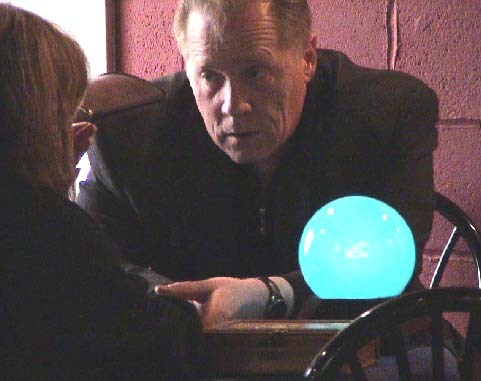 That affiliation, along with a general openness to psychic and occult phenomena in the 1970s, led to a decade of increased parapsychological research. Typically, a ghost "ghost hunting party" will involve individuals who work as a team to collect evidence of paranormal activity. Ghost hunters usually record data in a scientific manner, making observation using electronic equipment of various types, such as; EMF Meters, digital thermometers, infrared and night vision cameras, handheld video cameras, digital audio recorders, and computers. Organized teams of ghost hunters are also called paranormal investigation teams. Easy access to information on the world wide web, movies like White Noise, and TV shows like Most Haunted and Ghost Hunters are thought to be partly responsible for the current boom in ghost hunting. One popular website for ghost hunting enthusiasts lists over 300 of these organizations throughout the United States and the United Kingdom. Scores of small businesses selling ghost-hunting equipment, ghost investigation services, and even ghost counseling, are booming outside of their prime season, Halloween. Several companies recently introduced new devices billed as ghost detectors, along with the traditional electromagnetic field detectors, white noise generators, and infrared motion sensors. The paranormal boom is such that some small ghost-hunting related businesses are enjoying increased profits through podcast and web site advertising, books, DVDs, videos, and other commercial enterprises. While interest in the paranormal gains more popularity, so does the competition between ghost hunting organizations. As many groups get air time for publicity, personal rivalry and feuds are happening on a wide spread level. Larger groups such as TAPS (The Atlantic Paranormal Society) and IGHS (International Ghost Hunters Society) often attempt to discredit the other's paranormal claims. A ghost tour (also called a haunted tour, ghost walk, or haunted walk) is an activity themed around the paranormal providing an entertaining and often educational way to present ghostlore. Tours often take place around sites with a reputation for unusual occurrences. They are usually conducted at night and will combine a mix of history and legends. Presentations use drama, humour and analogies to weave stories in an interesting way. Tours may be conducted on foot, vehicle or even a self led tour finding clues along a predetermined route. Haunted locations are often regarded to contain the spirits of deceased beings who may have been former residents or were familiar with the property. Supernatural Activity inside homes is said to be mainly associated with violent or tragic events in the buildings past such as murder, accidental death, or suicide — sometimes in the recent or ancient past. Amongst many cultures and religions it is believed that the essence of a being such as the 'soul' continue to exist. Some philosophical and religious views argue that the 'spirts' of those who have died have not 'passed over' and are trapped inside the property where their memories and energy is strong. Entities which are said to 'haunt' homes are often known to make noises, appear as apparitions, and shift or launch physical objects. This is sometimes manifested into 'poltergeist activity'; poltergeist meaning 'noisy spirit'. Traditionally an exorcism is the method used to remove unwelcome spirits from the property. Fake or Explainable "Ghost Photos" and Photographs of all Paranormal Phenomena show proof of ghosts! If seeing is believing, then these photos will convince you of the existence of ghosts. Most of the best rmarkable ghost photos like the Brown Lady photo below were taken while not on a ghost hunt. Also see: A visitors gallery of paranornal and ghost images with stories of how and when the photo was taken please visit here. SciFi Channel recently greenlit a spinoff series titled "Ghost Hunters International" to air tentatively in January 2008. It would feature TAPS vets Robb Demarest, Andy Andrews, Brian Harnois, and Donna La Croix, along with Barry Fitzgerald (who appeared in the Ireland episodes of Ghost Hunters) and newcomer Shannon Sylvia. The format will be the same as Ghost Hunters but will feature locations around the world. 2007 Halloween Special - Live on October 31, 2007. TAPS will return to Waverly Hills Sanatorium for a 6-hour investigation. Joining the team will be guest paranormal investigator Joshua Gates from the show Destination Truth and WWE wrestler Elijah Burke. This show will also reveal the winner chosen among viewers as a new TAPS member picked from an online poll. Elijah will join lead Ghost Hunters Jason Hawes and Grant Wilson at the desolate and abandoned tuberculosis hospital, Waverly Hills. Some call the Louisville institution the scariest and most haunted place on Earth because thousands of people have died there. The six hour, live show will be hosted by Josh Gates of Destination Truth. Last Halloween, almost 1 million viewers tuned in to Ghost Hunters’ live, all-night ghost hunt with CM Punk at The Stanley Hotel (made famous in The Shining). And a personal note: I take my ECW Cm Punk action figure on every Ghost Hunt I do. News stories about ghosts, Haunted houses, Paranormal Research and ghost hunters, And Ghost Tours often fill TV, Newspapers and magazines articles on a daily basis hitting it's climax on Halloween. Many "Haunted Web Sites" like Haunted America Tours report over 12 million hits just for the month of October alone. Haunted Cemeteries - Come explore some of the world's most haunted cemeteries. The World's Most Haunted Cemetery may make you a real believer in ghosts. Some say the black ghost dogs guard these lonely places. Here is a collection of true ghost stories from the world's most haunted Cemeteries. This list will have some familiar names, and some places you never expected to be haunted. Paranormal activity is an really a very international affair, and ghosts and apparitions intermingle with the living everywhere day and night. When it comes to the number and regularity of ghost sightings and unexplained events, these real haunted Graveyards, Cemeteries and burial spots can't be beat. HAUNTED HOUSES - Americas' Most Haunted Houses - Haunted Houses | Haunted Mansions | Haunted Plantations. A haunted house is defined as building that people live in that is a center for supernatural occurrences or paranormal phenomena. Some haunted houses are known to be haunted by the ghosts of dogs. A haunted house may contain ghosts, poltergeists, or even demons. Haunted Battlefields - American Battlefield Ghost Hunters always suggest that planning ahead can often make the difference between a good ghost hunting trip and a great trip to National Battlefield Park.Some tales tek if ghostly dogs haunting the many battlefields in America. Explore these pages to discover the essential things you need to know before you leave home—how to get around the park, where pets are allowed, how to stay safe, and more important a ghost photo or ghost story to read and plan to investigate.